Pro Rank Tracker Review: a Formidable SEO Keyword Tracking Tool? Pro Rank Tracker is a lovely SERP tracking tool for blog and websites. It lets you track keyword ranking position across all popular search engines. We’ve used Pro Rank Tracker tool for most of our niche sites and still recommends their services for ease of use, accuracy and support for multiple locations. In this short review, we are going to introduce their services, list their features and share our personal experiences with Pro Rank Tracker app. What to Expect from this Premium Rank Tracking Tool? Pro Rank Tracker is a SEO tool that offers a unique advantage over its competitors, offering the most current and easy to understand information on search engine optimization. It tracks the keywords you provide and helps to gather valuable data on your keyword performance in search engines. With Pro Rank Tracker, you can maximize your income and upscale your business to success. Thousands of companies, freelancers, agencies, and organizations around the world use Pro Rank Tracker to help them create and promote efficient SEO (Search Engine Optimization), as well as search engine marketing (SEM) initiatives, and for increasing their presence on the Internet. ProRankTracker web app lets you improve your online visibility and also monitors your keyword positions in the search results pages of online search engines (SERPs) such as Google, Bing and Yahoo. 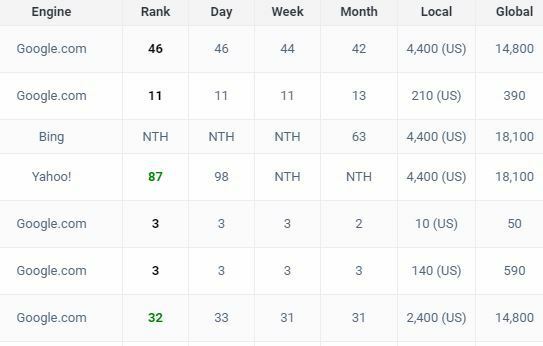 While Pro Rank Tracker is not the only accurate rank tracking tool on the internet, it does come with lots of competitive features. As a cloud-based application, Pro Ranking Tracker lets you access it from any location or devices – including smartphones. 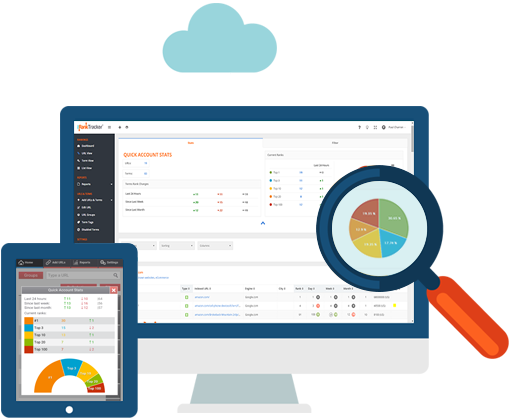 Their rank monitoring and reporting service is one of the most accurate algorithm of any ranking monitoring software program on the internet. In addition to that, Pro Rank Tracker guarantees the protection of the information on its websites by guiding their user’s privacy. Pro Rank Tracker SEO tool changes the way you test data from the positions of your online search engines with its specific algorithm that is able to offer the most accurate and up-to-date results on the position of your Internet sites. You can add keywords to let this tool track their positions in search engines. Pro Rank Tracker app eliminates manual tracking and reporting system as you’ll no longer need to manually gather and analyze all the tables and figures to see where the tracked terms are classified. Pro Ranking Tracker does everything automatically, allowing you to channel your time, your efforts and concentration on other important things like content creation and posts promotion. Automatic day-to-day updates can help improve your content presentations. You can also decide to perform updates on-demand. As a cloud-based solution, Pro Ranking Tracker does not need you to stick to your screen to follow the rankings of your websites. You can easily access the system from any type of device with the help of Internet connection. Whether you’re in the area or having lunch, you can quickly look at your position using your smart device or tablet. With Pro Rank Tracker app, there’s linguistic assistance functions that eliminates the need of an external translation software program to understand the reports and progress of Pro Rank Tracker. The software is offered in different languages, including English, French, Danish, Dutch, German, Spanish, Italian, Japanese, Portuguese, Swedish, and Turkish. Global, local and international tracking. Information about the number of keyword phrases. Multiple languages and Daily Automatic Updates. Accurate algorithm and Worldwide recognition. A wider search engines coverage. YouTube and Google videos tracking. Brand sub-accounts and 24/7 Ticket Support. Mobile rank tracking via MyRank mobile application. Exact Search Volume, Cloud Storage, and PRT Mobile App. PDF, XLSX, as well as CSV file formats. The least expensive plan is the 7 days free trial plan that lets you add 2 URLs and 20 keywords. This is followed closely by the bronze plan that goes for $19 per month, and lets you add three hundred search terms (keywords), one update as needed, and provision for a secondary account. The Bronze+ plan sells for $39 and gives you access to 800 search terms (or keywords), 2 sub-accounts, 1 on-demand updates, and accessibility to “MyRanks Client App”. Going with the silver plan that sells for $59 gives you access to 1,500 search terms (or keywords), 3 sub-accounts, 2 on-demand updates, and accessibility to the MyRanks customer application, which you can use to mark your report as a brand name for customers. The gold plan that sells for $119 gives you access to 3,500 search terms (or keywords), 5 sub-accounts, 2 on-demand updates, and access to MyRanks Client App. When you spend more monthly on your plan, you’ll acquire even more search terms, sub-accounts, and updates as needed. The retail sales plan for companies (Agency plans) starts from $189 per month to $899 per month and provides access to API and a dedicated account manager. My first impressions of Pro Rank Tracker are all positive. I was impressed by the ease of use and the many useful tools. The support for exhaustive list of search engines is another thing that attracted me to this awesome SEO tool. So far, I have had no issue with their reports and felt fine with their mobile app as well. I found that classification records, classification recommendations, and key phrase exploration devices are especially useful. Actually, it helped me to see where it was located and it also helped me to orientate myself in the ideal direction on what objective to follow next. To get more of the many records that are offered, it is essential to include more relevant keywords and track them gradually. This will help you see exactly how the key articles and key locations on your website are performing. Since most SEO tools are cloud-based, I had no issue with sharing SEO report. It syncs well with other SEO tracking tools I use and has proven useful till date. All in all, I recommend Rank Tracker Pro for SEOs, Bloggers, internet marketers and companies that are interested in tracking the performance of their keywords in search engines. Have a thing or two to say about Rank Tracker Pro? Tell us in the comments section below.